The answer may not be as obvious as you might think! There are advantages and disadvantages to both styles. So, you are looking to save some space by using a transforming console to dinner table? It certainly is a great idea to free up a small living room space. As a compact decorative console when not in dining mode, or as a extended table with leaf extensions added in to build out length. Now what you need to consider is, if you want a model with separately stored extensions, or one that stores them inside the table (self contained). There are some differences to consider. Console tables like the Junior Giant are very popular because of the sleek and beautiful design. The Junior Giant has contoured edges and the sides are closed together leaving a very clean look. 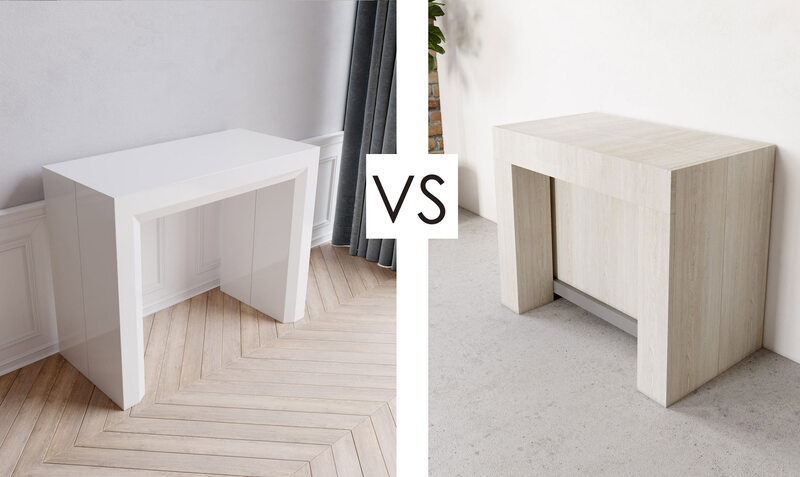 Aesthetics aside, there is also another advantage many customers do not consider with a non storage table like this: the storage compartment can get in the way of using the table! 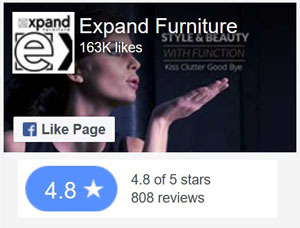 What we mean is that the process to grab a single extension stored in a nearby closet and enlarge your table can be easier than opening and removing multiple extensions from inside the table – all depending on how the extensions are stored. It can be more labor intensive than a closet grab of a leaf extension or two. In a small square setting: The advantage leans towards the non stored extensions models where you add 1 extension in the table. 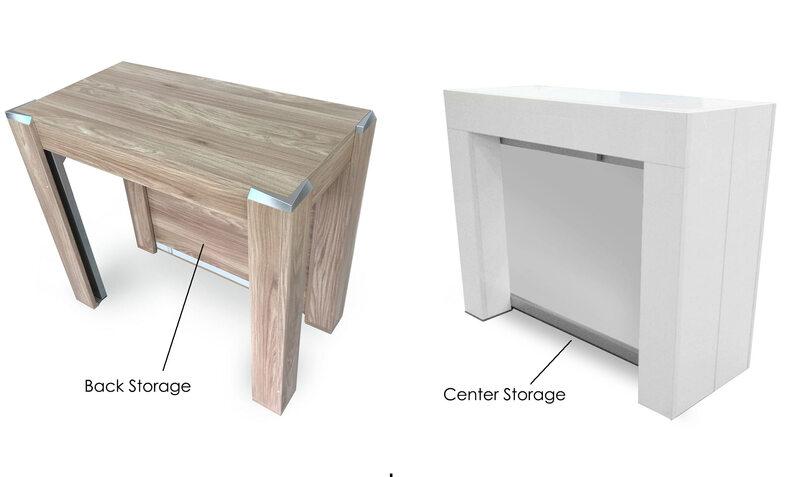 The problem with a smaller setting (table of 2-4) and the self storing model (Cubist or Expanda) is that the actual storage container can block out an end or get in the way of your legs stretching through the middle. In a small apartment where you are eating every day with 2-4 people, non storage consoles like the Junior Giant is the practical choice. Advantages as a work desk: With the non storage model (Junior Giant) your legs can stretch through to the back when using the console as a small desk. A self storage model would give you minimal room. Disadvantage: You need to store the extensions elsewhere. Solve this with good storage solutions! Inefficient storage: Some customers ask us about a storage box that can be built for the extensions, but this is not space efficient as the box would be very bulky and you then need a large space to store this box. Efficient storage: Most often you can find ‘dead space’ in a closet or cupboard on the very sides. This is a perfect place to fit 2 extensions per side for easy access. 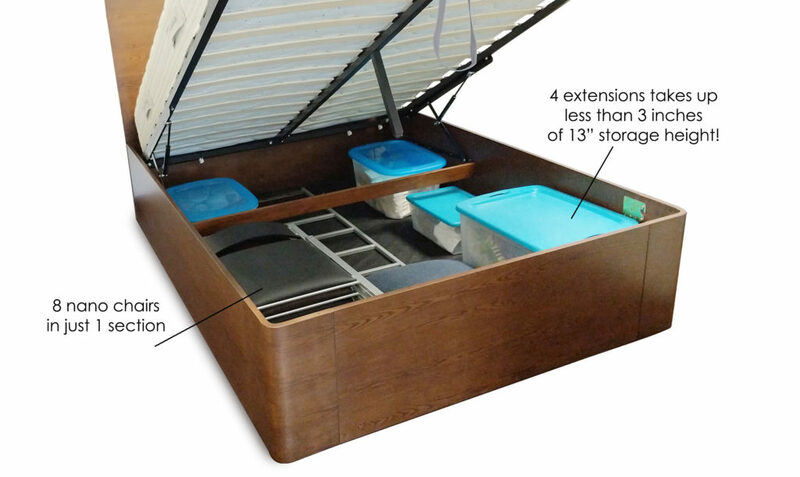 Another great option is to go for a storage bed like the Reveal or Pratico which can house 8 nano chairs and all your extensions in it while only using a small portion of your storage area. 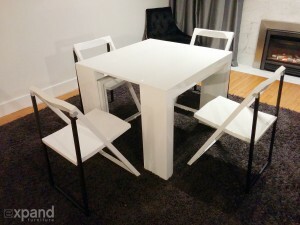 The non storage style tables like the Junior Giant are popular apartment model choices because of its well thought out size, and its convenience as a compact table with less extensions. 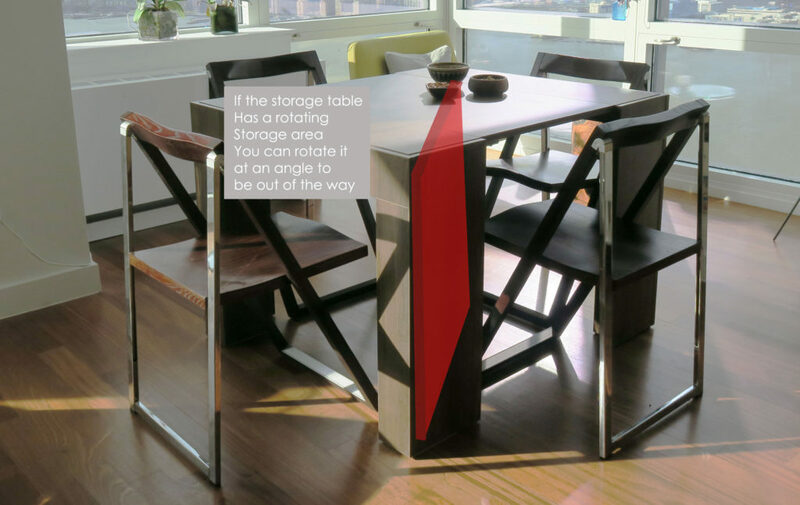 This style of table is not the solution for everyone though and self storing tables like the Cubist have advantages to consider for the savvy small space solution seeker. Tables like the Cubist or Expanda can be very convenient and are more space efficient than the Junior Giant style. In some new builds the square footage is shrinking with even the area around appliances becoming minimal, let alone more condensed rooms. These self storing models make for great decorative consoles and pack away tightly against a wall while offering the ability to transform into massive dinner tables. Advantage: The extensions are right there for you to add and build the size you need. This is really fantastic if you use your dining table less and mostly eat at the kitchen bar in your home. On the occasion when you use the table in a larger form you can add in a few extensions and have a lavish setting. 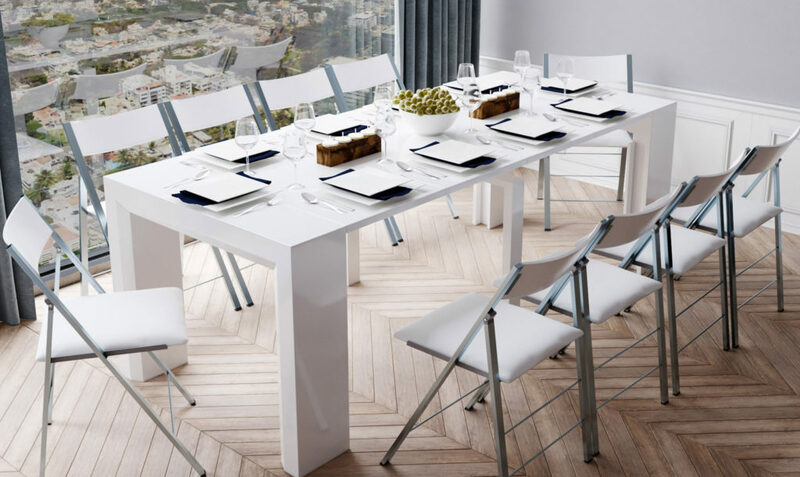 The cubist model stores the extensions in the middle and when extended with 2 or more leaf extensions, the middle piece can rotate completely out of the way for a very convenient table setting. It also hides the extensions really well with a closed off side. The Expanda hides them in the back instead, so they are not visible from the side either. Disadvantage: When in it’s smallest form these self storing tables do not make a great console desk since the extensions block your legs from going through. Consider this table should be used moreover as decorative console in the smallest form, but can make a great table working desk if you simply add in 1 extension to fit your legs through and work files on top. On a table like the Expanda the extensions block out the back of the table where the leaves are stored. On this table you can’t use all sides of this table until all extensions are added in. For the Cubist table the extensions are in the middle and also rotate. Because of this rotating design the extensions do not block any side of the table and are out of the way if you have 2 or more extensions in it. The cubist is a very effective table for this reason and only has a slight inconvenience in the smallest square form (you can also angle the extensions seen in the photo below). 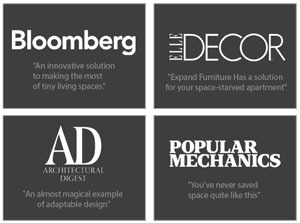 All in all, both styles are excellent space saving solutions with slight advantages for each design. 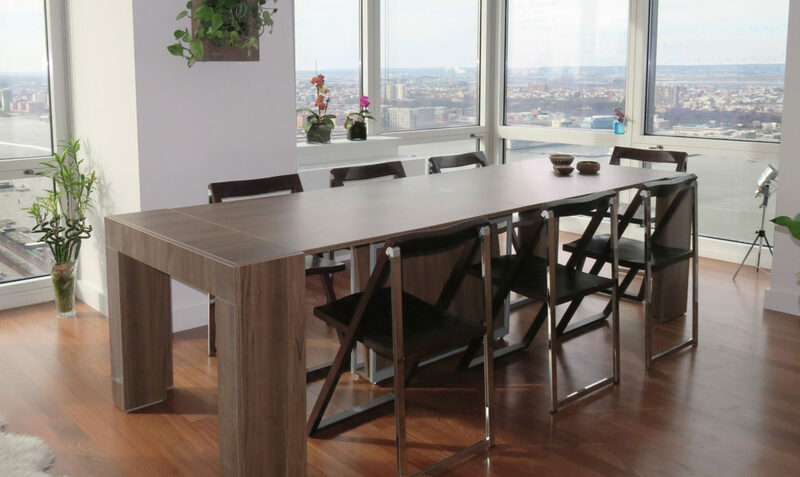 In summary, if you are in an apartment and often eat with 2-4 people or plan to use the transforming table as a desk, then the Junior Giant is a great choice. If you don’t plan on using the table as a desk or in the smallest table form, the self contained storage and a rotating leg option makes the Cubist an excellent table that seats 12+.